Walnuts will grow in many different soils and situations. In general they require a freely draining but moist soil profile, the deeper the better. 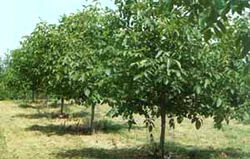 While windbreaks and shelterbelts are useful to the establishment and general speedy development of new plantings, these must not be allowed to overshadow the walnuts. Nuts will not ripen properly on darkened or shaded trees. The best times for planting are November/December or January/February, as long as the ground is unfrozen. If it is not practical to plant the tree on delivery it is best to leave it unopened if delivered in a sealed package or, if bare-rooted in a bag it can be 'heeled in' for a short time, for example into a border or vegetable garden. Care must be taken not to bury the graft union which must always remain above ground level. Young walnuts are particularly thick and sturdy and seldom need staking after the first couple of years. A generous hole should be dug to give a lot of clearance around the root in depth and spread. This allows conditioning of the soil - for instance adjusting the pH or incorporating humus-forming matter such as well-rotted leaf mould. Compost may be added to the spoil at the base of the hole but this should not be placed around or near the roots as it will not help (and may hinder) them developing. A mulch mat (of woven agricultural textile) or a mulch of some non-nutritious material is important in the early years. Deep mulches of bark peelings or similar organic matter are greatly appreciated later on and serve the plant well in case of dry springs. Fertilizers are not a good idea in the first couple of years but can be a useful supplement as the plants become reestablished. In very dry seasons young walnuts must be watered, especially in the first couple of years. Root development may begin as early as February and so it is important that the trees need for water is met through April and May.